Dante in the Woods: The Potential of the Para-University "
I am a scholar in the woods. 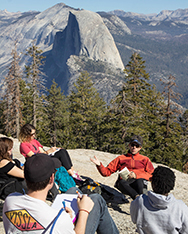 My classroom, nestled fourteen miles south of a main entrance to Yosemite National Park, is the High Sierra Humanities Program of Azusa Pacific University. My curriculum is composed of “core texts”—Dante, Augustine, Confucius, Teresa of Avila, William James, Dostoevsky, Zora Neale Hurston—even though no one in higher education today seems able to agree about what precisely those texts form the core of. Perhaps they are like the core of an apple, inedible and discarded? Or perhaps they are like the core of a nuclear reactor, dynamic and combustible? My program is traditionally described as an “off-campus experience,” but I prefer to conceive of it instead as an experimental lab for testing new pedagogies and institutional structures to serve the advancement of Christian humanistic study in an age of widespread corporatization. It is a para-university. The hue and cry surrounding the declining economic and social status of the humanities in the twenty-first century seldom produces any feasible proposals for reorganizing the structures that are primarily responsible for that decline. More commonly, attempts to explain the embarrassing scarcity of, say, English and history majors, fall back on abstract cultural polemics or hand-wringing eulogies for the classics. For instance, William Deresiewicz’s much-discussed book about the disadvantages of elite education in the Ivy League, Excellent Sheep (2015), is long on trenchant diagnosis, but painfully short on effective prescription. “With credentialism,” argues Deresiewicz, “comes a narrow practicality that’s capable of understanding education only in terms of immediate utility,” and he proceeds to recount the sordid history that transformed scholarship into utilitarianism. But what to do about the problem now? The solution is unclear. Similarly—and somewhat paradoxically—perspectives arising from professional programs are similarly vague on this crucial point. Stephany Schlachter, provost of Lewis University in Romeoville, Illinois, wrote eloquently in the Easter 2017 issue of the Cresset of the positive impact studying the humanities has had on her own professional perspectives as a nurse and administrator. She nevertheless acknowledges, in a graciously framed understatement, that “we continue to face challenges to making this integration [of liberal learning with professional programs] successful.” Schlachter contends that today’s undergraduates “do not always understand the full value of general education requirements,” and urges that “we need to help them better understand.” But, again, how? I would like to propose, somewhat less graciously, that today’s undergraduates “do not always understand” the full value of general education requirements precisely because they are not receiving that full value. In other words, they do understand that the current economic structures they inhabit mean to cheat them out of a valuable experience, even though they cannot yet imagine what that valuable experience might be. It is as if hungry diners who had never tasted Thai cuisine decided to venture out in pursuit of Massaman curry, satay, and pad thai. Imagine them arriving at their chosen restaurant only to find drab décor and a demoralized wait staff. They have no reason to doubt the delights of Thai food in principle, but they will not be eating here. Para-university educational models offer a specific solution to the challenges facing the humanities today by reorganizing existing resources to support new pedagogical and disciplinary structures so that the tarnished value of our current general educational offerings might be polished and restored. What is a para-university? It is helpful to begin with negative definitions. It is not the same as an “off-campus program,” although the para-university I work for happens to be housed in one. It is not an honors college; it is not an independent entity like the Oregon Extension; it is not an academic department or school; it is not a service department, such as the registrar or bursar, whose role is to support everyday functions. Rather, a para-university is better likened to the R&D department of a tech company. It is a developmental space set aside to insure innovation and future competitiveness. A para-university, then, is any university program that exists alongside its institution’s mission but outside its institution’s entrenched presuppositions. It serves as a check against the inevitable cultural inertias that plague all large organizations, against the tendency to collapse into a logic of mere precedent: “That’s how we do it, because that’s how we have always done it.” Para-universities are adaptive and experimental zones, but on a scale small enough to prevent major disruptions to the whole. Because of this scale, they will never be profit centers, but neither need they be financial sinkholes. They prove their worth in terms of their added value to a university’s overall educational product, in the intellectual capabilities, reshaped desires, spiritual flourishing, and, dare I say, customer satisfaction of the humans it graduates. The particular para-university I work for, the High Sierra Humanities Program, is experimental in precisely this way. Not everything we try works. However, the successes, both anecdotal and quantitative, are so remarkably potent that the failures pale by comparison. For example, students who attend our program are far more likely to graduate from Azusa Pacific University than the average—by about fifteen percentage points. The para-university model is particularly well-suited to address the contemporary crisis in the humanities in faith-based institutions because this crisis has actually been sustained by the staleness of our regimented disciplinary entrenchments, prejudicial and outdated forms whose existence can now be justified only by institutions with luxurious endowments. The question now is whether humanities departments can invent ways to collaborate on curricular decisions without compromising the intellectual depth that can only be produced by disciplinary specialization. If such a collaboration could be cultivated, more undergraduates would seek out the general education experience at the college level, because it would actually provide the value it has the potential to deliver. In para-university spaces, it is possible to experiment with practical approaches to such collaboration without disturbing (at least not yet) the disciplinary turf. colleges and universities all around the country, and possibly even for free online. 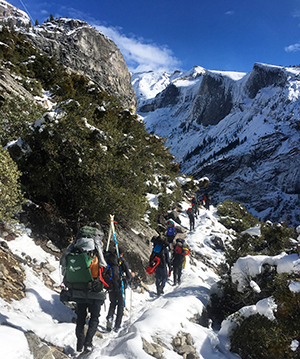 But in the second week of my semester, students leave the classroom for a week to embark on a five-day trek in the Ansel Adams Wilderness. Sometimes the weather conditions cooperate; sometimes they don’t. I can remember camping with my students by an alpine lake at 10,000 feet as eighteen inches of snow fell softly around us overnight, burying our equipment, seeping slowly into our tents as we tried to sleep. Dante’s Commedia reads differently in class after a shared experience like that. As readers of Dante know, his masterpiece begins in failure, by losing the straight path. Dante’s pilgrimage makes progress only through a series of radical reorientations from hell to paradise, transitions which demonstrate to him experientially that down is really up and that his ways are not God’s ways. The curricular structure of my para-university provides enough flexibility so that we can briefly extricate ourselves from the often predictable and numbing ebb and flow of the traditional academic semester just long enough to prepare students affectively for what they are about to receive intellectually and spiritually. Like Dante, my students and I share a pilgrimage, and they can now begin more readily to accept that professors—their guides—are not, despite decades of hard-earned expertise, immune to the material rigors of the communal journey. In a celebrated essay first published in 1995, “The Autonomy of Affect,” Brian Massumi set the stage for what has now become the burgeoning interdisciplinary field of affect theory. Massumi pointed out the fundamental difference between emotion and affect, the former being phenomenological, the latter being physiological. In other words, what we are conscious of “feeling” and how our bodies actually react to affective stimuli are not always congruent. Massumi’s insights are central to the para-university approach to the humanities followed in my program. My students don’t always “like” reading Dante. Similarly, they don’t always “like” hiking at 10,000 feet. As you might imagine, students tend to run the gamut in their emotional responses to both of these activities. But my students’ affective orientations to Dante and other core texts in the humanities have altered drastically by the end of the semester, whether they liked reading the Commedia or not. Even if they find the reading difficult and confusing, their membership in a small cohort community gradually converts initial frustration into curiosity and enlarged capacities for attention. Their preconscious dispositions about the literary experience are even more important than the intellectual content they retain from it—indeed, the latter depends upon the former. As Aristotle foresaw long ago, it is possible to educate desire without dictating taste. But such an endeavor cannot proceed merely on the basis of expert intellectual instruction or disciplinary savvy. Those are necessary conditions of humanities education, not sufficient ones. One need not, of course, go hiking with students in order to create conditions of affective engagement. However, the current status quo of “cafeteria” general education requirements, taught largely by overworked and underpaid adjuncts, or by professors who would rather be elsewhere, is almost guaranteed to fail. Such a system creates a negative feedback loop: disenchantment with general education leads to shrinking humanities departments which then can justify their budgets only by teaching more lackluster general education courses. Despite the criticism it has received for its statistical methodology, Richard Arum and Josipa Roksa’s Academically Adrift: Limited Learning on College Campuses (2011) correctly diagnosed the institutional dilemma underlying the affective shortcomings in humanities pedagogy: “No actors in the system are primarily interested in undergraduate student growth, although many are interested in student retention and persistence” (125). In a para-university, however, it becomes possible to model future changes that might bring our professional incentives into greater alignment with graduating the kinds of students Christian universities claim to produce: spiritually mature critical thinkers with marketable skills. My second example of the functioning of my para-university, therefore, focuses on the creative way we have sought to integrate our institution’s general education requirements in a “plenary” format. Azusa Pacific University requires all undergraduates to take one course in “Intercultural Competence” and another in “Civic Engagement” before graduating. Many colleges have such requirements. And, on the main campus of my institution, these requirements are generally met within individual majors in courses like “World Religions” (for the former) and “American Government” (for the latter). The faculty and staff of my para-university, after much discussion, concluded that these two separate requirements were too closely related to be considered in isolation. How can one be genuinely civically engaged in twenty-first century America without also learning some intercultural competence? Our solution was to combine the two requirements into a single syllabus that studies environmental ethics from the perspective of cultural privilege. Together we read Carolyn Finney’s book Black Faces, White Spaces, which argues that the historical denial of land to African-Americans has constructed geographically privileged areas, including the national park just down the road from our campus. At the conclusion of the semester, we invited Professor Finney to come speak to us about her work during a “mini-conference” that was run in part by the undergraduates themselves. After the mini-conference, all our students had earned college credit toward either “Intercultural Competence” or “Civic Engagement.” But, more importantly, they were actually more competent and engaged. The difference was achieved not by a shift in intellectual content, but rather by a shift in affective orientation, communal learning, and institutional structures. It seems increasingly likely to me that the future of the humanities in higher education will depend on our ability to redesign the packaging of general education course requirements in the ways described above, and that para-universities are the institutional spaces required for invention. Such reformations promise deeper student learning and affective engagement, more efficient paths to graduation, more numerous opportunities for faith integration, and greater intellectual rewards for faculty. Despite the commercial connotations of the word, such “repackaging” need not acquiesce to a production-line ideology in which students are conceived of merely as commodities. And, even if it did acquiesce to such pressures, it might still constitute an improvement. For, sadly, in purely administrative terms, that is the reality many Christian scholars in the humanities already regularly confront. The High Sierra Program of Azusa Pacific University will host a Lilly Fellows Network Exchange for ten faculty and administrators from March 27-31, 2019. The Network Exchange will showcase this program's para-university model and engage participants in conversations about the of future of humanities education in Christian colleges and universities. Applications, due October 1, 2018, are now open at http://www.lillyfellows.org/grants-and-prizes/network-exchange/. *"The straight way was lost," from the first stanza of Dante's Divine Comedy, when the Pilgrim wanders into a dark wood, getting lost in order (eventually) to be found. Christopher S. Noble is professor of English at Azusa Pacific University, where he has taught since 2001. He lives in Oakhurst, California, with his wife, two daughters, and one headstrong cat.